In the late 1930s, Monty Stratton of the Chicago White Sox was one of the best and most praised pitchers in major-league baseball and was about to enter the prime of his career. “Monty Stratton looks as if he is going to furnish many a page in baseball history before he gives up,” Philadelphia sportswriter James Isaminger wrote about the affable 6-foot-6 pitcher.1 “He is the nearest thing to Grover Cleveland Alexander,” said Cubs manager Charlie Grimm. “The same control, the same ‘dip’ on every pitch, the same smooth, confident motion.”2 But then came a dark November day in 1938 that would change the course of Stratton’s life. Monty Franklin Stratton was born on May 21, 1912, on his family’s farm in Wagner, Texas. He was the sixth of nine children born to Lee Davis and Minnie Aster Corine Stratton. While growing up on the farm, Stratton was too occupied with school and working the family farm to dream about becoming a major leaguer, although he did find some time to occasionally play ball with the other kids. “I played wherever they wanted me to,” he once said, which was usually first base or one of the outfield positions, but never pitcher.3 In 1930 Monty’s father, Lee Davis Stratton, died, leaving his widow the proprietor of the farm, thus forcing Monty to spend more time working the farm with less time for school and baseball. His heavy workload included attending to the livestock and working the cotton fields. And so Shorty grabbed his mitt and tagged along with his classmates to the local field – and hurled a 2-0 shutout. His impressive performance created an opportunity for him to pitch for local semipro teams for as much as $2 a game. On June 2, with the White Sox trailing the Tigers 10-0 in the sixth inning, Dykes believed the time was right for Stratton to pitch in his first major-league game. The scribes in the press box immediately commented on his height. “Monty Stratton, who appears eight feet tall, but is only six feet six, pitched the last three innings and held the enemy to two runs, principally because his mates executed a couple of sterling double plays,” wrote the Chicago Tribune’s Edward Burns.10 One week later, feeling more seasoning was necessary, the White Sox sent Stratton to Omaha of the Western League. At Omaha, Stratton became an immediate hit with the fans, for his size and his pitching; the local press referred to him as “that long lean fellow from the South with the amazing curve ball.”11Handicapped by a lack of hitting and fielding support, he still managed to win eight of his 18 decisions and struck out 11 or more batters three times. Also while in Omaha, he met a local resident named Ethel Milberger, an “attractive brunette.”12 The two began a courtship that would lead to marriage in January of 1936. Two weeks later Stratton faced another challenge when he was selected to start against the Cleveland Indians, who were riding an eight-game winning streak. “Stratton got off to an inauspicious start by allowing two first inning runs, but then held the Indians scoreless the rest of the way in a 9-2 Chicago win for his first major league win,” said the Chicago Tribune.16 He registered one more decision before the end of the season, a loss to the pennant-bound Tigers, to finish his 1935 major-league season at 1-2. On May 25 it was reported that Stratton was suffering from sore throat, while a further examination revealed a case of tonsillitis. Before a decision could be made about surgery, his appendix began to ache and would have to definitely be removed. As he recovered from surgery, another operation was performed to remove his tonsils. The two operations made Stratton inactive until late August. He did return to action and pitched three more wins to finish the season at 5-7. Stratton’s 1937 season began with a 5-1 win over the Browns. “Stratton operated in such talented fashion that most of the afternoon wore away before the enemy located second base,” wrote Vaughn.20 One week later he became the first American League pitcher of the season to record a shutout. By the time the All-Star break arrived, Stratton had 10 wins to earn a spot on the American League’s All-Star roster. However, a wrist injury sustained while sliding into second base at St. Louis on July Fourth canceled his trip to the midsummer classic in Washington. Stratton’s injured wrist didn’t cause him to miss any starts, and on July 31 he blanked the A’s for his fifth shutout of the season. On August 5 he was pitching at Yankee Stadium in search of his 15th win when, in the bottom of the fifth, with Chicago ahead, 3-1, as Stratton threw to Yankees third baseman Red Rolfe, he felt a sharp pain in his throwing arm, forcing him to leave the game. Feeling he could work out the soreness, he continued to throw in the bullpen during the days that followed, but when that proved ineffective he submitted to an examination, which disclosed a tear in his right bicep. 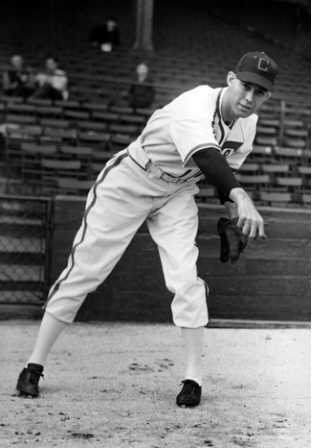 When he felt well enough to pitch, he returned to the rotation on August 29 against the Philadelphia Athletics, and was knocked out of the box by an avalanche of hits before the first inning was over. He took more time to heal and returned to pitch the final game of the season, during which he was said to “look fair” but not sensational in gaining his 15th win.21 He finished his season with a 15-5 record, a 2.40 ERA and walked just 37 in 164⅔ innings pitched. Before heading home to Texas for the winter, Stratton said he expected to win 20 to 25 games in 1938. On November 28 his wife gave birth to the couple’s first child, a boy, Monty Jr.
Could Monty Stratton repeat his 1937 performance of 15 victories? He looked good in his first two spring-training outings. In his next game, against the Chicago Cubs, he burned a strike past Billy Herman, then turned to the dugout to call for manager Jimmy Dykes. He felt a sharp pain his arm and asked to be taken out. Eleven days later he made his first start of the season and went the distance for the win, which, according to Burns, convinced observers that he would be as good as he was the previous season. Two weeks later, Stratton was said to be in “superb form” as he hurled another victory.24 At the All-Star break, although not selected to the All-Star team, Stratton was 6-3, a great record considering that the White Sox were decimated by injuries. After the All-Star break, Stratton defeated the Yankees at Yankee Stadium, and came back to beat them again later in the season. He finished the 1938 season with 15 wins, “an impressive total for a man who missed seven weeks of the race,” noted Vaughn.25 He lost nine games, walked just 56 batters in 186⅓ innings, and posted a 4.01 ERA. Once again Stratton headed back to Texas for the winter. During Thanksgiving weekend he drove his wife and child to spend the holiday with his family on his mother’s farm, “Where we were all born,” said his brother Hardin.26 It was a big weekend for Monty and Ethel, as Monty Jr. would be one year old on November 28. On the 27th, Stratton decided to take a stroll by himself near the farm and hunt rabbits with a .22 caliber pistol he had purchased the previous summer in Chicago. While he wandered along a path a half-mile from the house, he spotted a rabbit just ahead. He took out the gun, fired, and then, “Monty stuck the gun in his holster and thought he had it on ‘safety,’ but it wasn’t,” according to Hardin Stratton.27 The gun fired and a bullet entered Stratton’s right thigh and settled behind the knee. He fell to the ground in pain. Stratton kept his heart set on being able to pitch in a game during the season. Manager Jimmy Dykes heard his repeated request but feared that opposing teams would “bunt him brutally.”44Dykes promised Stratton that he could pitch on the last day of the season if the White Sox had third place clinched, but when that time came the White Sox were in fourth place, not third, and Stratton never got his chance. After the 1940 season, Ethel gave birth to another boy, Dennis. At this point, after two seasons as a coach, Stratton returned to the farming life in Texas, but did not lose sight of returning to the pitcher’s mound. “After I left the White Sox, I still wanted to pitch,” he said. “My wife kept saying, ‘if only we could find someone who will give you a chance. I just know you could win a lot of games.’”45 Stratton stayed in shape by pitching to his wife, throwing against the barn and practicing coordination in his living room. Stratton loved his time in Hollywood but admitted that he missed Texas and the farming life. He intended to retire from baseball, but his love for the game kept him active for a few more seasons. “Spring comes around and the grass gets green and baseball gets into your blood, I guess,” said Stratton.53 Another reason for his decision to continue to pitch was that the movie was a box-office hit and made him something of a celebrity. “A lot of people wanted to see me (pitch),” Stratton said.54 He pitched in 14 games over the course of the next five seasons for various minor-league teams in Texas before packing it in as a professional. Stratton continued to work on his farm with the same dexterity that he displayed during his remarkable pitching comeback. He drove a car and occasionally played catch with Ethel. He said he was never bothered by the loss of his major-league career or the artificial leg. “It now feels as if I was born with it,” he said.55 In 1961 Stratton was inducted into the Texas Sports Hall of Fame. A few years later he endured another tragedy when his son Dennis was found dead from a self-inflicted gunshot wound. Monty Stratton died on September 29, 1982, at the age of 70. He was buried at Memoryland Memorial Park in Greenville, Texas. 1 Philadelphia Inquirer, August 1, 1937. 2 Chicago Daily News, November 30, 1938. 4 Unidentified newspaper article found in the Monty Stratton player file at the National Baseball Hall of Fame's Giamatti Research Center, Cooperstown, New York. 5 Unidentified newspaper press release, January 16, 1938, in Stratton file. 6 Unidentified newspaper clipping dated August 22, 1935, in Stratton file. 7 John Carmichael, "The Barber," 1937 article in Stratton file. 8 Chicago Daily News, November 30, 1938. 9 Unidentified newspaper in Stratton file. 10 Chicago Tribune, June 3, 1934. It was 3⅓ innings, to be more precise. 11 Omaha World-Herald, August 5, 1934. 12 New York Times, April 24, 1949. 13 St. Paul Press, April 9, 1935. 14 St. Paul Press, July 31, 1935. 15 Chicago Tribune, September 8, 1935. 16 Chicago Tribune, September 23, 1935. 17 Chicago Tribune, April 3, 1936. 18 Chicago Tribune, April 11, 1936. 19 Chicago Tribune, May 8, 1936. 20 Chicago Tribune, April 23, 1937. 21 Chicago Tribune, October 4, 1937. 22 Chicago Tribune, April 7, 1938. 23 Chicago Tribune, May 14, 1938. 24 Chicago Tribune, June 3, 1938. 25 Chicago Tribune, September 21, 1938. 26 Harold Sheldon, "Finishing the Stratton Story," Baseball Digest, September 1949. 29 Undated Chicago Daily News article in Stratton file. 33 Chicago Tribune, November 28, 1938. 34 Chicago Tribune, November 29, 1938. 36 Chicago Tribune, December 23, 1938. 38 Chicago Tribune, December 11, 1938. 39 Chicago Tribune, April 7, 1939. 40 Unidentified newspaper article dated April 20, 1939, in Stratton file. 41 Chicago Tribune, April 7, 1939. 42 Unidentified newspaper article dated April 20, 1939, in Stratton file. 43 Chicago Tribune, May 2, 1939. 45 Philadelphia Inquirer, January 30, 1947. 46 L.H. Addington, "Monty Stratton’s Courageous Comeback," June 1947 article, soiurce unidentified, in the Stratton file. 47 Philadelphia Inquirer, January 30, 1947. 50 New York Times, April 24, 1949. 52 Washington Post, September 7, 1947. 53 Los Angeles Times, June 19, 1950. 54 Unidentified newspaper article, July 14, 1974, in Stratton file. For more detailed information on the making of The Stratton Story: Rob Edelman, “Of Black Sox, Ball Yards, and Monty Stratton: Chicago Baseball Movies,” in North Side, South Side, All Around the Town: Baseball in Chicago (The National Pastime, SABR, 2015). 55 New York Times, April 24, 1949. 56 St. Louis Globe-Democrat, October 28, 1982.